On an earlier page I walked along the path on the ridgeline north and east of Kamakura, seeing several yagura. 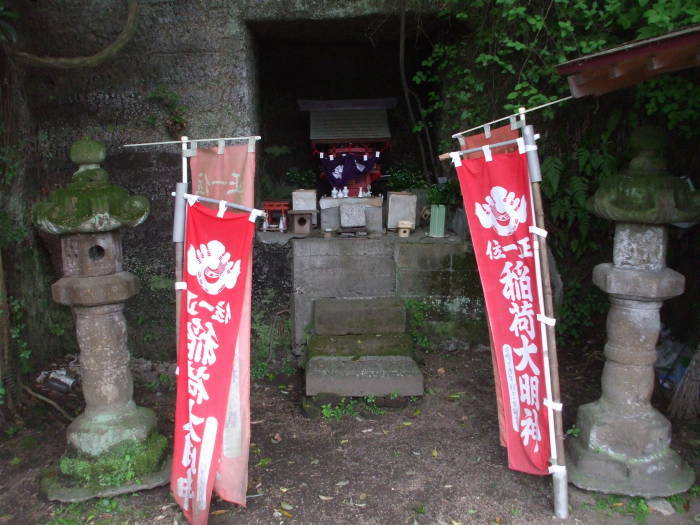 These are the medieval era rock-carved tombs where the samurai class were buried or at least memorialized. Now I will visit a few more right in town, and one near Kita-Kamakura just to the north. Start at the entrance at the sound end of the Hachiman-gū shrine complex. 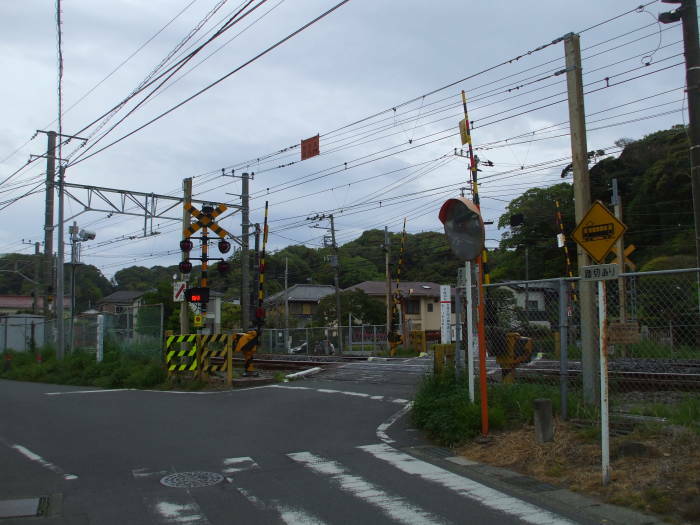 Walk to the west a few blocks, crossing the railroad tracks, then turn right to the north. 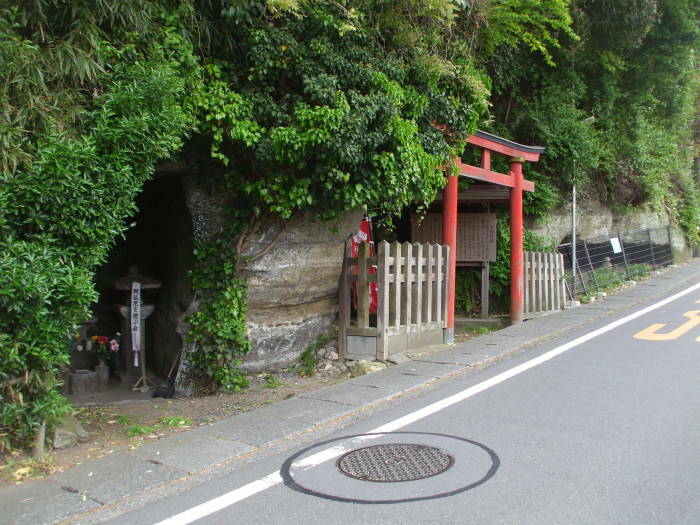 There are several small temples and shrines along this street. But this is Japan, so there are temples and shrines everywhere. Anyway, continue north to the next street that crosses the tracks, headed off to your right. Keep going north, parallel to the tracks. 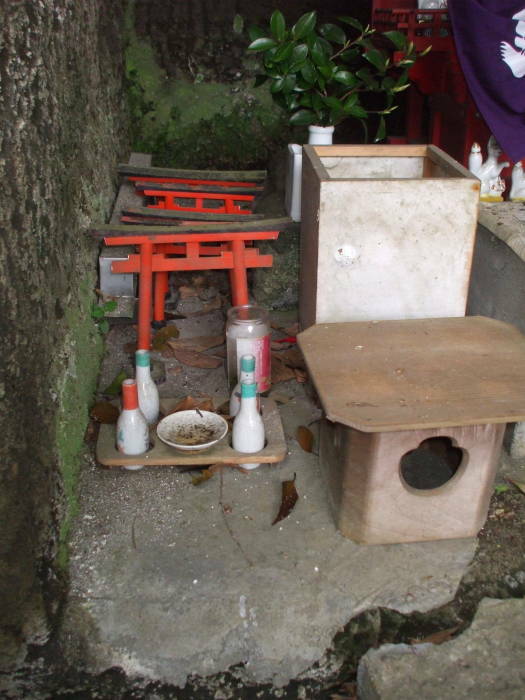 Above is a tiny minimalist shrine. It is so austere that I can't decide whether it's Buddhist or Shintō as there aren't any details to classify it. So I decide that its austerity is the clue. This must be Shintō. The Chinese Book of Liang recorded in 635 that five Buddhist monks from Gandhāra had visited Japan in 467. The official arrival of Buddhism was in 552 CE, when King Seong of Baekje (now western Korea) sent a mission to the Japanese Emperor Kinmei. Official Buddhism wasn't a practical movement. For its first few centuries in Japan, Buddhist temples were staffed by educated priests who prayed for the prosperity of the nation and the Imperial house. Buddhism wasn't for the masses. Uneducated, unordained, and unofficial "people's priests" ministered to the common people. They practiced a combination of Daoist and Buddhist philosophy mixed with elements of the native shamanism. Buddhism and Shintō became blended. Shinbutsu-shūgō sanctioned the blend. This was the idea that a Shintō kami could manifest as a Buddhist bodhisattva (or bosatsu in Japanese). 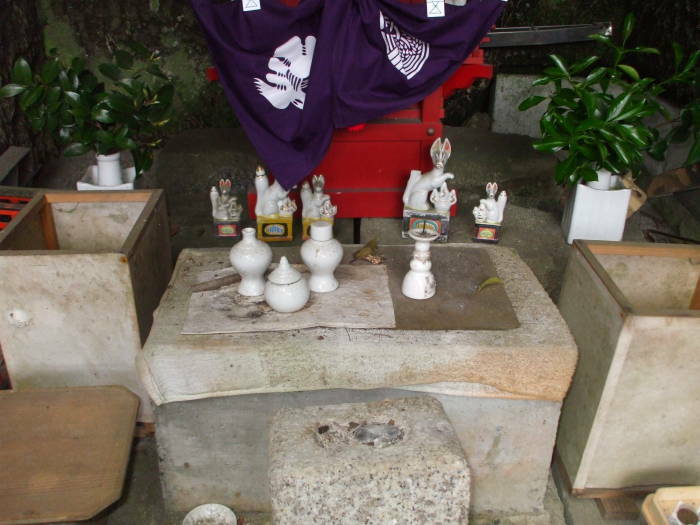 Buddhist temples hosted Shintō shrines, and vice-versa. Shintō remained the tradition of the Emperor. Of course it did. Its tenets held that the Emperor was a descendent of the deities who had created Japan. It's good to be the king, but it's even better to be a god. Buddhism, especially Zen, was more attractive to the temporal rulers — the Shōgun war lords and the samurai warriors. The common people followed a mix of traditions. Ahead are some yagura. 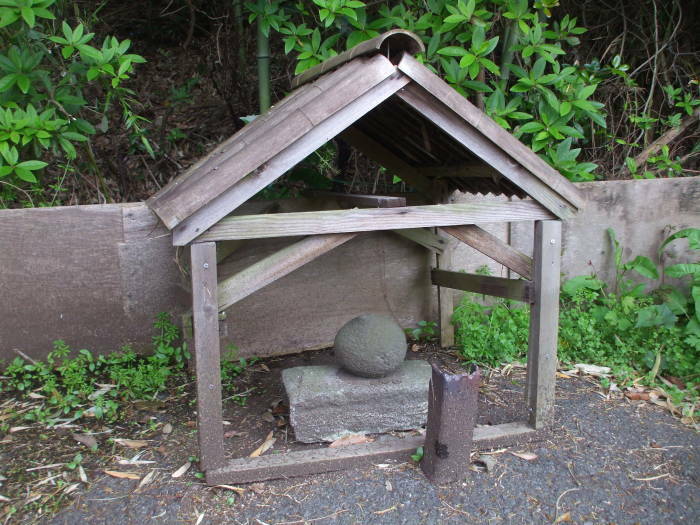 One of them is now converted from its original Buddhist purpose into a Shintō shrine. These are carved into the soft sandstone. The large stone marker at center is a form of pagoda. I know just enough to say that pagodas usually have an odd number of levels, and so this 6-level pagoda is a little unusual. More interesting are the two small stone markers to the left. They are simplified versions of classic Buddhist grave markers. 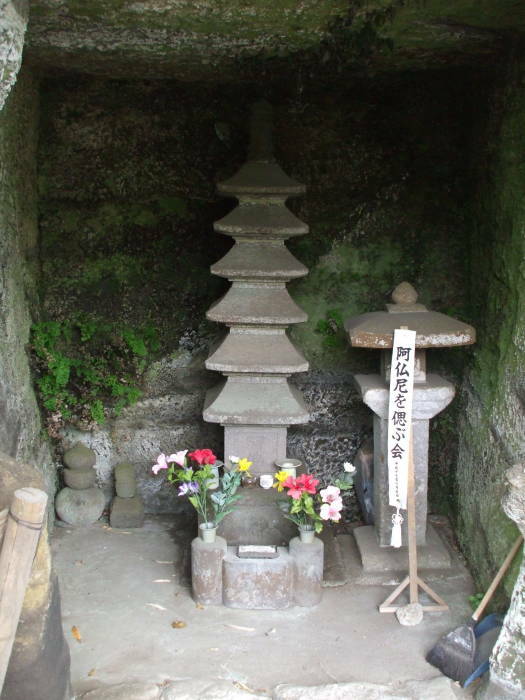 A gorintō is a Five-Ringed Tower, a stone form of pagoda with five layers of symbolic shapes. The five segments of the full gorintō represent the Buddhist cosmology. They form the body of the cosmic Buddha Mahāvairocana, our own bodies, and the physical world. Jewel-shape or Space at the top, cube or Earth at the bottom. The five elements plus wisdom make up the universe. The elements are not destroyed at death, and so it is possible to join with Mahāvairocana. More elaborate examples bear Sanskrit letters in the Siddhaṃ script. The central yagura in this group is now a Shintō shrine. A vermillion and black torii marks the passage from the outside world into its sacred interior. 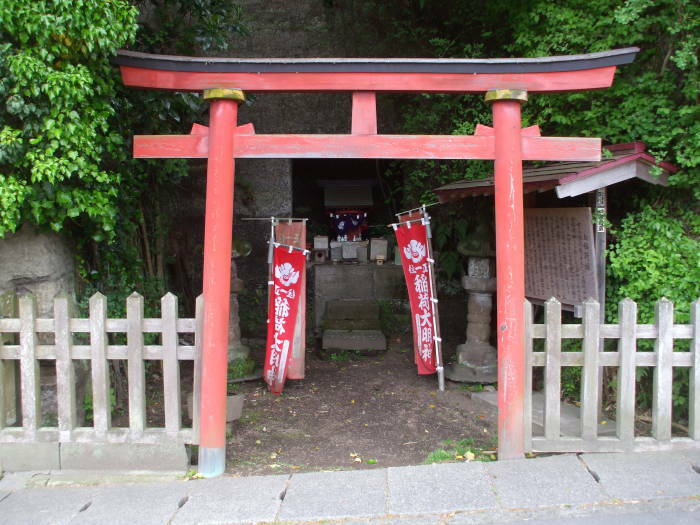 A Shintō shrine is a jinja, a dwelling for the kami or spirit enshrined there. The actual shrine holding the kami is the miniature building in the inner carved chamber of the yagura. The go-shintai, the sacred god-body, is inside. That is, if the central totemic object exists. Often it's all symbolic. But if it exists, it isn't actually the kami. 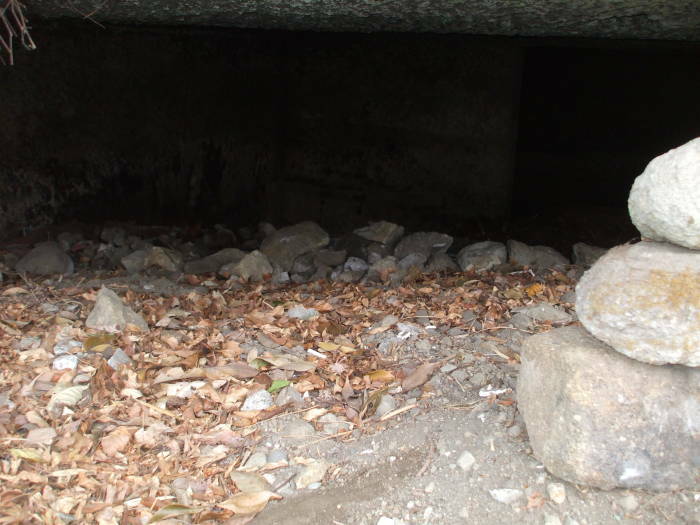 It's a temporary repository which makes the kami accessible to human beings for worship. Got it? Yeah, me neither. It's not an obvious or simple system of spirituality. As usual, there are foxes as kitsune or guardians. Foxes are believed to have magical powers as they are messengers of Inari Ōkami, the general-purpose deity of good harvests, fertility, rice, tea and sake, and general prosperity and worldly success. Their representations are often wear red votive bibs. The third yagura in this group is much simpler. it's a very low passage maybe a meter tall at its highest point, with a deeper niche at one rear corner. 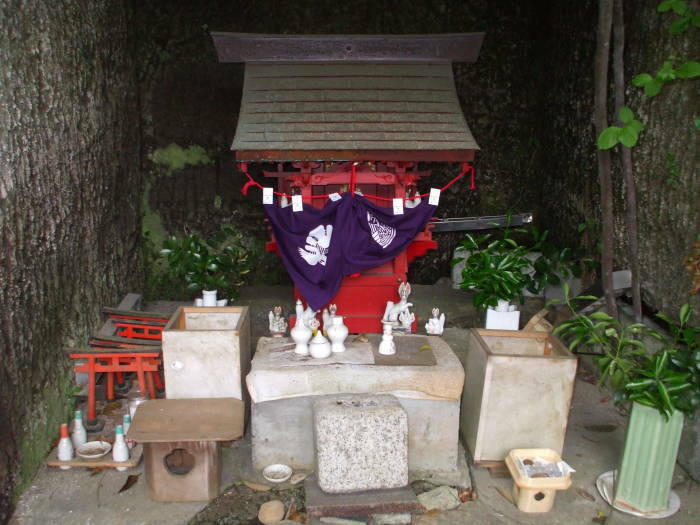 A partial gorintō stands at the opening. Here's the description on the slip you get with your entrance ticket at Meigetsu-in. 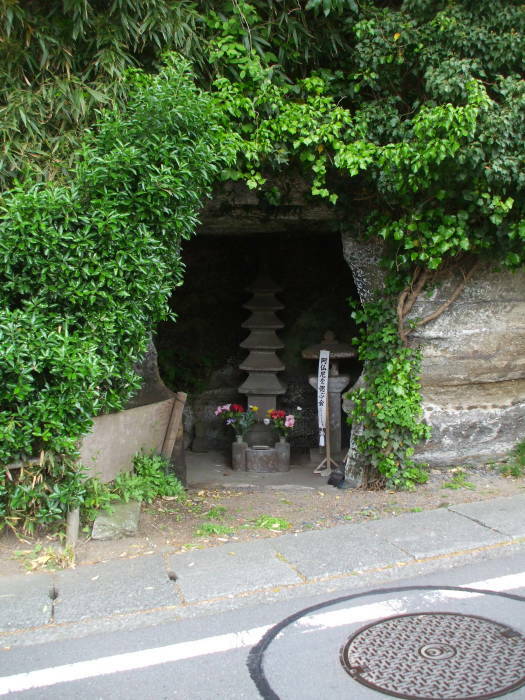 The term "yagura" refers to the cave tombs built commonly in medieval Kamakura. Seven meters in width, three in height and six in depth, the Meigetsu-in yagura is one of the largest remaining in this city. 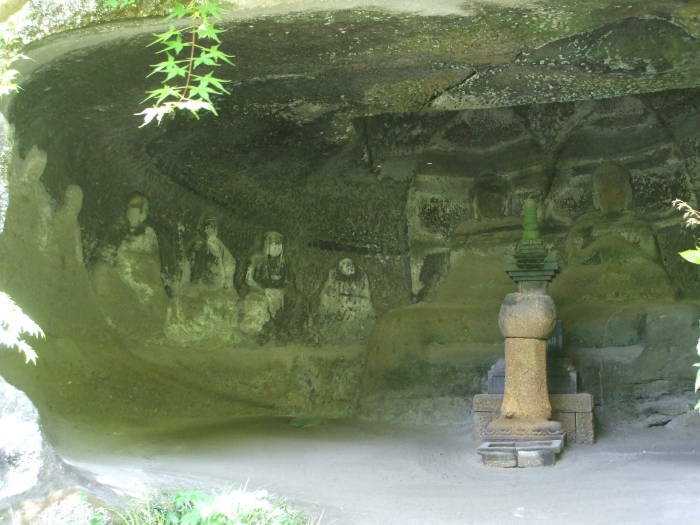 Figures of Shaka Nyorai (Shakyamuni), Taho Nyrorai and the 16 Arhats are carved in relief on the walls, and at the center is a hogyointo gravestone belonging to Uesugi Norikata, restorer of Meigetsu-in. 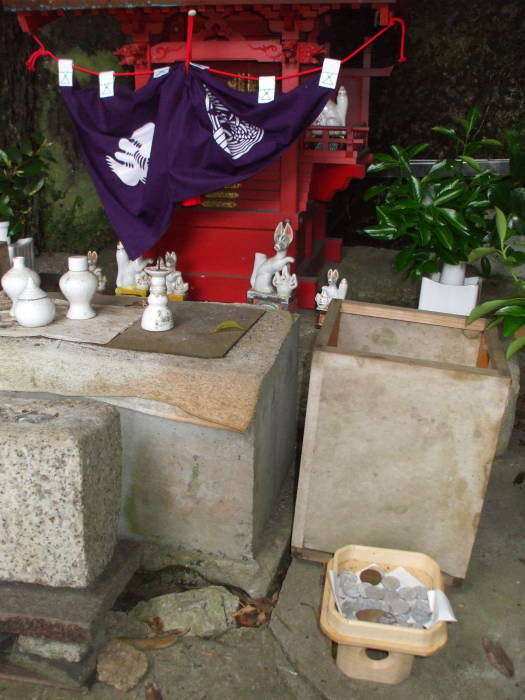 In front of the gravestone is an incense burner of the Zen Buddhist style. 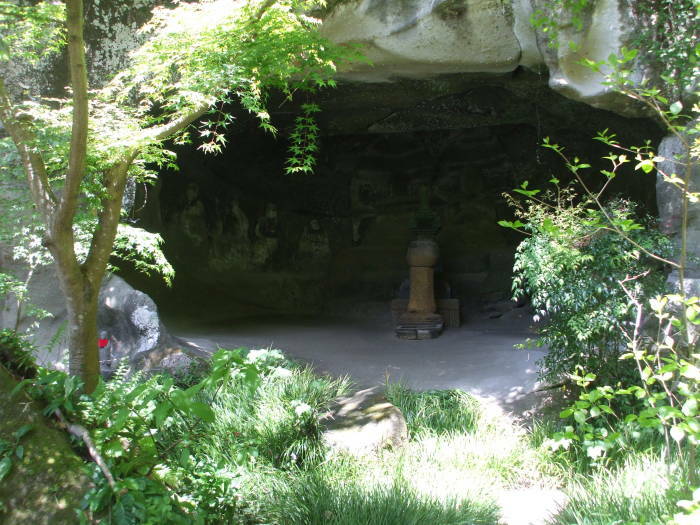 Legend has it that the yagura was built in 1160 by Yamanouchi Tsunetoshi as a tomb for his father Toshimichi who died in Kyōto during the battle of Heiji, and that Uesugi Norikata erected his own gravestone here some 220 years later. But time has erased the inscriptions in the yagura and so the exact circumstances of construction remain a mystery. Norikata was a great-grandson of Uesugi Shigefusa and an ancestor of the Yamanouchi-Uesugi Clan. Defeated in battle by Hōjō Ujiyasu, his descendant Norimasa sought the protection of Nagao Kagetora in Echigo Province and gave him the family name. Kagetora thus became Uesugi Kenshin, the famous military leader of medieval Japan.